The VTech ErisStation® VCS704 is a conference phone designed for small and medium sized businesses, that comes with 3 free headsets. The phone is compatible with existing phone systems and resists interference from mobile phones and other mobile devices. It delivers crystal clear audio conferencing by eliminating conference table clutter. The VCS704 features Dynamic Noise Reduction technology, delivering free flowing and productive conferencing. A 7-feet microphone coverage is perfect for small to midsize conference rooms and up to 150 feet wireless range offers mobility to move around conference room or between offices. The VTech VCS704 has many exciting features for users of all types. You can extend the lifetime of your VTech VCS704 with the purchase of a FactoryOutletStore Factory Protection Plan. 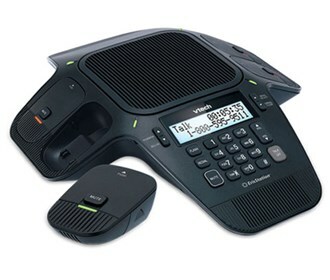 See the VTech VCS704 product video and gallery images above for more details. The VTech VCS704 is sold as a Brand New Unopened Item.